The mountains are home. The wilderness is home. Northern New Hampshire is home. The Shady Pines Sled Dogs started in 2011, after Sally spent years learning the ropes in a local tour kennel guiding clients. From there, over time, Sally built a team from local kennels and friends. 2012 was the first race, the Can Am 30 mile race, and within two years the team was entering 250 mile races. 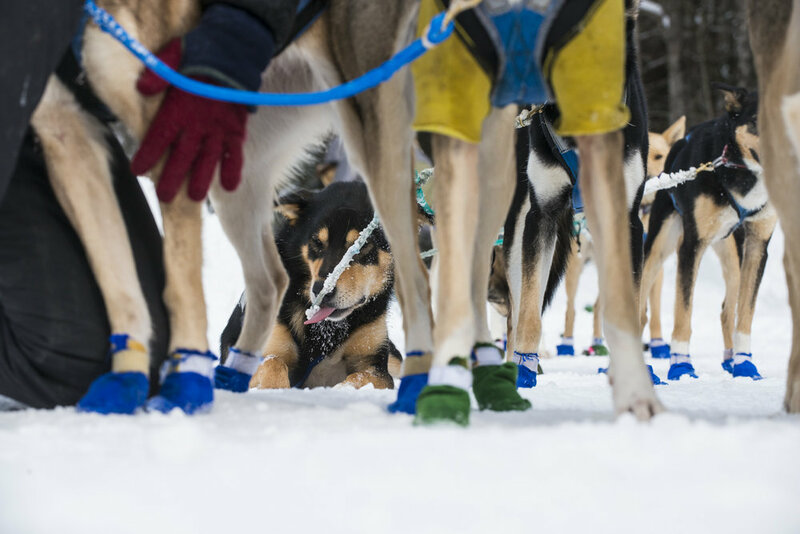 The core of the team lay in the original group of dogs, who were sold from a musher getting out of the sport. Those dogs, Taz, Thai, Wembley, Chase, House, Foreman Maihi and Tawhio, set the gold standard in what is possible for speed, endurance, and, most importantly, teamwork. Those dogs have all moved onto pet homes, excepting Wembley who has stayed on permanently to guide the next generation. The current Shady Pines dogs come from some of the best kennels in the sport, from Michigan to Alaska. For those who are curious, the bloodlines that currently run through the team are Swingley, Solomon, Mackey, and Tremblay. The question comes less often than it used to, but ‘Why ‘Shady Pines’? The name is a reference to the 1980’s sitcom The Golden Girls, where Shady Pines was the nursing home that was burned down by Sofia, one of the characters. The Golden Girls is not only a TV show Sally watched once, it is one of the all-time favorite series of her disabled brother David, and David used to spend a lot of time joking about Shady Pines throughout their growing-up together. The same year that Sally acquired her first sled dogs, she also moved in with her disabled brother and sister and became their caregiver. In a decision to try to knit together her human and canine worlds, she named the kennel ‘Shady Pines.’ In the years since, David spends less time talking about TV shows and more time talking about the dogs, keeping track of all their movements from his view into the dogyard and greeting dogs from his window when they are loaded into the truck. As described in the About the Musher page, mushing is a way of living and being in the world. That is our story.